The City of Austin prides itself on being WEIRD. Odd, yet fantastic at the same time. Inspired by this weirdness, Cannon + Belle Restaurant provides locally sourced Texas comfort food with an unpredictable twist. You can find local kombucha on tap, brick oven breakfast pizza, mac ‘n’ cheese with burnt brisket ends, pork chops with cherry-miso mostarda and 72-hour braised short ribs – all on the same menu. Even the restaurant’s name is based on a strange, yet fascinating historical event. Heroine Angelina Belle Eberly warned fellow Austinites of the theft of the Texas archives by firing a six-pound cannon into the General Land Office Building in 1842. This alerted the vigilante “Committee of Safety” group tasked with protecting the government archives and keeping them in Austin. The group chased down the stolen archives and brought them back to the city, thus ensuring that Austin remained the Texas capital. 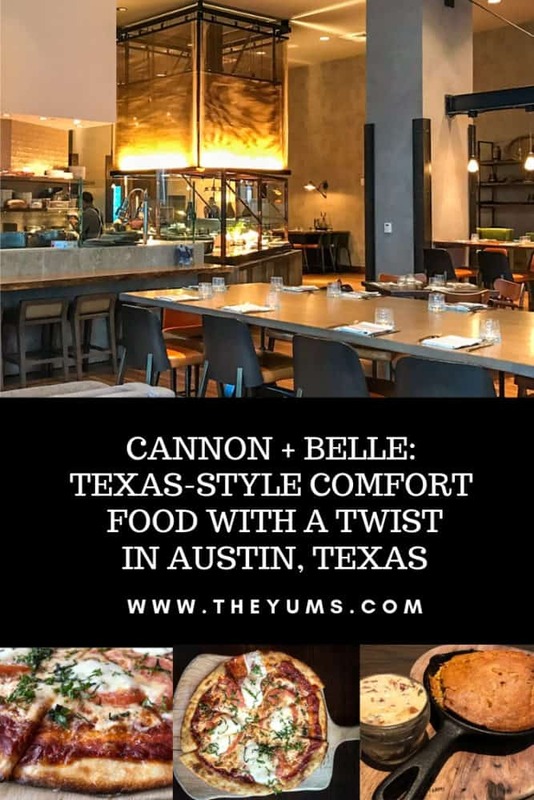 Location: Cannon and Belle is located in the heart of downtown Austin at 500 E 4th Street, Austin, Texas in the Hilton Austin Hotel. Free hotel parking is available for restaurant guests. Menu: Cannon + Belle offers Texas-style comfort food with a creative flair. Breakfast ranges from cold-pressed juices, house-made granola, pancakes with vanilla bean and brown sugar, savory handcrafted omelets, and Texas Brisket Hash. Handcrafted tangy BBQ short rib pizza baked in a wood-fired oven, beer braised beef with pickled peach slaw, and burgers with Belle’s special grinds are only a few of the many delicious lunch and dinner items. The delectable dessert menu includes a warm cream cheese brownie, seasonal fruit crisp with house-made crumble, lemon cake with seasonal sorbet and local honey, a four-layer chocolate cake, and various flavors of ice cream and sorbet. On tap Ktonic Kombucha, Little City cold brew coffee, Texas wines, and beer are all fresh and locally sourced. Thoughts: Often hotel restaurants are mediocre; however, that was definitely not the case with Cannon + Belle. We started with the cornbread with bacon butter, a perfect sweet and savory combination served in a heavy cast iron skillet and perfect for sharing. I also had the handcrafted Margherita pizza, layered with tangy tomato sauce, fresh tomatoes, basil and mozzarella on a thin crust pizza shell and served on a wooden oven peel. Service was friendly and attentive. The restaurant itself had a sophisticated, yet relaxing atmosphere with classy decor, floor to ceiling windows with a view of downtown, an open concept kitchen and comfortable dining room chairs and booth seating. A live jazz band played on some days, which meant that I didn’t even need to leave the hotel to find great local music. It was the perfect place to relax, eat great food and visit with my new friends during the conference. Reservations are recommended since the restaurant can get busy – it is a prime spot for convention goers since it is located so close the Austin convention center and is in the Austin Hilton Hotel. Price: Prices were reasonable considering that ingredients are freshly sourced from local farms and many of the foods (even the granola) are house-made. Breakfast pizzas run between $13-14, brioche French toast is $11, Texas brisket hash is $12 and the yogurt bowl with house-made granola is $9. Appetizers ranged from $6 chips and dip to $15 for crab cake; mains range between $15 for The Belle burger to $39 for the ancho chili espresso rubbed ribeye. Desserts ranged from $4 for scoops of ice cream to $10 for the four-layer chocolate cake. For Pinterest: Pin this to your favorite Austin restaurant board.